Director: Matthew Heineman. Cast: Rosamund Pike, Jamie Dornan, Tom Hollander, Nikki Amuka-Bird, Stanley Tucci, Greg Wise, Faye Marsay, Alexandra Moen, Corey Johnson, Jérémie Laheurte, Fady Elsayed, Raad Rawi, Jesuthasan Antonythasan. 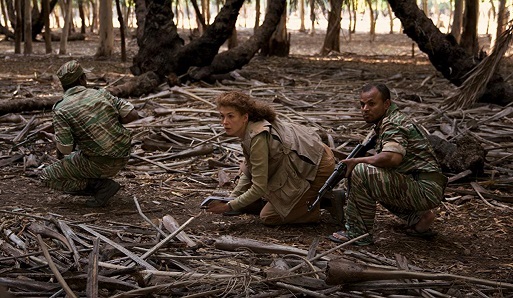 Screenplay: Arash Amel (based on the Vanity Fair article "Marie Colvin's Private War" by Marie Brenner). Twitter Capsule: Pike really impressed me. Weird editing turns scenes and structure to shrapnel. Quite uneven, but I'm glad I saw it. VOR: ③ Genre trappings, story beats feel borrowed, but Marie's scary zeal feels fresh. Erratic structure is an almost-unwitting plus. Syrian finale is bracing. Best Original Song: "Requiem for a Private War"